The Ohio Revised Code prescribes the maximum gross weight of, and axle and wheel load for, a vehicle traveling on public highways and streets in Ohio. 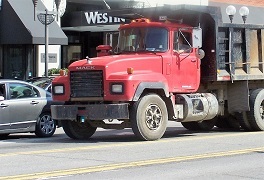 Under Ohio law, there are instances in which a surface mining truck may exceed the maximums allowed. The term “surface mining truck” has been defined by the Ohio Attorney General to mean a “vehicle” used to haul minerals (a.k.a. aggregate). “Minerals” means sand, gravel, clay, shale, gypsum, halite, limestone, dolomite, sandstone, other stone, metalliferous or nonmetalliferous ore, or other material or substance of commercial value excavated in a solid state from natural deposits on or in the earth, but does not include coal or peat. As long as a surface mining truck does not exceed the gross vehicle weight provisions or load limits by more than seven and one-half per cent (7.5%), no penalty shall be imposed. In addition to surface mining trucks, vehicles transporting coal, farm commodities, timber, solid waste, asphalt material, concrete, and certain other materials may be permitted a 7.5% weight variance. If you have received an overweight citation, Kyle D. Tucker may be able to assist you.